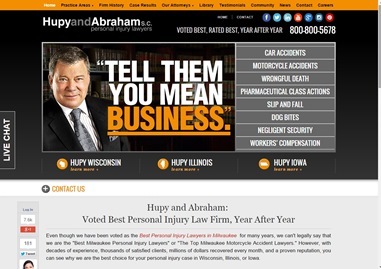 Hupy and Abraham Unveils New Website | Hupy and Abraham, S.C. 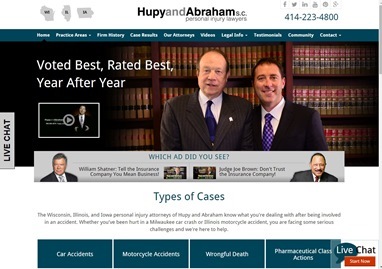 Personal injury law firm, Hupy and Abraham has updated its website at www.hupy.com. The firm collaborated with Foster Web Marketing and made a number of changes to the site. Navigating through the new website gives the most user-friendly interface to date. The color scheme has changed. The site is now primarily blue and white compared to the previous orange and black. The firm’s television spots are very prominent due to our two spokespersons: William Shatner and Judge Joe Brown. A designated section on the home page brings up a directory of all their TV spots. Brief explanations of the firm’s practice areas are located directly on the front page because of the new design. Providing easier access to videos, the new site provides visitors a chance to view our extensive video library including the brand-new “Watch for Pedestrians” PSAs. And, Our Attorneys section features all 19 attorneys — separated by shareholders and offices. Some of the site’s details remain the same. The free-offers portion of the site, where visitors can sign up to receive additional information and materials, is still easily attainable. Fresh content is uploaded to the site daily and Hupy and Abraham’s live chat assistance is still present. With 24/7 availability, the firm is able to provide people the information they or their loved ones need after being in an accident. The chat/contact feature also allows clients to notify the firm or their attorney if needed. These new and improved features set a new standard for the client experience that Hupy and Abraham has consistently provided so clients receive the best service that they deserve.